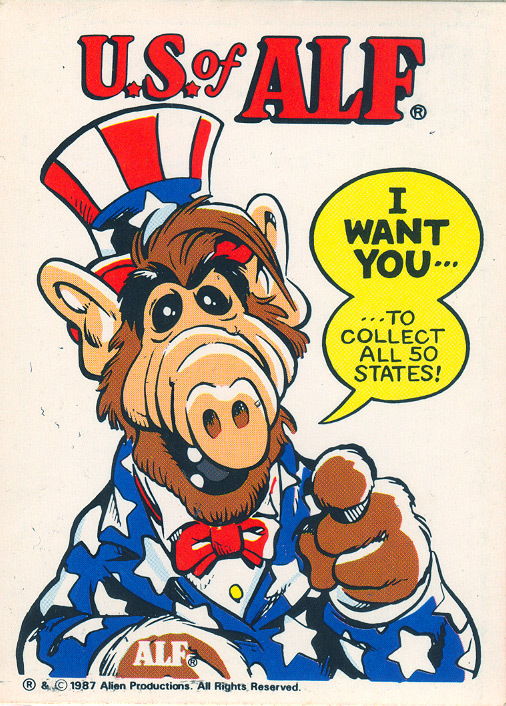 Like the alien life form said, “I want you… …to collect all 50 states!” and in 1987, my love of geography and Alf we perfectly combined in a trading card set (which i guess had 51 cards since the Uncle Sam card was a checklist). 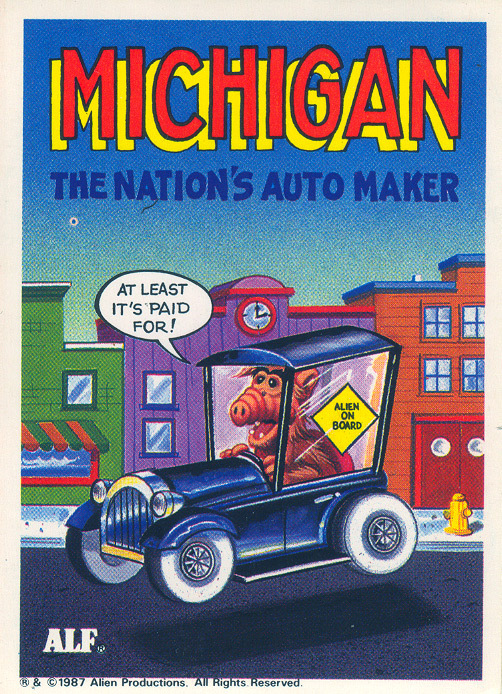 If memory serves me right, there was only one or two states I never found, so when I recently remembered I had these cards buried among some garbage pail kids and other assorted 80s trading cards, I figured I should start to share them. “Alien Productions” is to thank for these genius cards loaded with hilarious humor. I’ll be posting them in no particular order, but you can see just how funny the check list and Michigan are. Did you notice the topical “alien on board” window sticker! HA! I kill me! Did I find these funny cause I was 10 or cause it was written by a heroin addict? Oddly enough these were made in Italy. Was Alf ever an international sensation? Want More Back Issues,Found Photos,My Collections? ALF was an interplanetary sensation! i just noticed his car is floating. why is that? Subscribe to the Comments Feed for all posts or just this post.